The sun has sent me into some crazy proud-to-be-British mood as I seem to be going Jubilee crazy! I think also after realising I was the same age as my daughter when it was the Silver Jubilee in 1977 it has made me feel very nostalgic. I can remember getting an ice-cream cone and sitting on the banking at school in the sunshine dressed from head to toe in red, white and blue. I still remember that as the most amazing thing that ever happened at school. Then taking home a commemorative silver spoon was almost too much excitement! 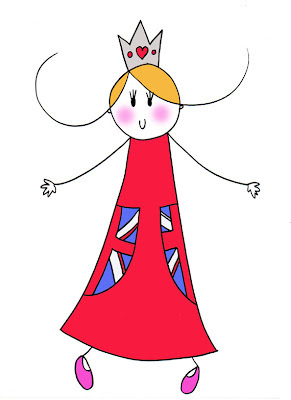 My daughter is getting a Jubilee lunch at school next week and I really hope they do the whole red, white and blue thing too. I think whatever happens there will be some fun flag waving going on here!